Fourteen year old Joan, runs away to Baltimore and changes her name to Janet Lovelace. Because she’s a “big ox of a girl” she claims to be eighteen. She gets off the train in the dark, gets lost, has nowhere to sleep. A young man comes to her rescue. 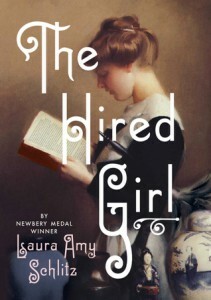 Catholic Janet is hired by the young man’s Jewish family in “The Hired Girl” (Candlewick 2015) by Newbery Medalist Laura Amy Schlitz. Janet scrubs, cooks, and beats carpets for the Rosenbach family, who live a kosher life. The other servant is Jewish Malka, who raised Mr. Rosenbach, and is like a family member. When touchy Malka complains about Janet’s crucifix, or for using the wrong sink, Mr. Rosenbach must instruct Janet. When he discovers her love of reading and her keen, if naïve, insights, they gently bond. Still, he insists she apologize to Malka. Following Janet’s thought process is one of the sweetest literary experiences I’ve had in some time. Mrs. Rosenbach, who has no appreciation of Janet’s sense of romance and of doing good, is harder on Janet. Whereas Janet sometimes detests Mrs. Rosenbach, she’s fair about her assessment and appreciates the steely woman for her sharp intellect. The Rosenbach sons come and go from the house and it’s difficult for Janet not to fall in love. They’re intermittently charming to her. And kind. After living in a farm household filled with rough hewn men, these new kindnesses look like professions of love to Janet. Of course it’s confusing. But when she sees her mistake, she does her utmost to help in the match-making with the young woman she sees as the real object of his desire. This causes worse problems. But Janet means well. And the youngest Rosenbach, Mimi, is naughty, hates to read, and hates the strictures of her class. Janet will do her utmost to help Mimi. Oy vey! Did I say it was a diary? It is bound to become a classic. It’s too wonderful.